The Oberweis International Opportunities Institutional Fund’s investment objective is to maximize long-term capital appreciation. The Fund invests principally in the common stocks of companies that Oberweis believes have the potential for significant long-term growth in market value. The Fund invests, under normal circumstances, at least 80% of its net assets in the securities of companies based outside the United States. The Fund seeks to invest in those companies that Oberweis considers to have above-average long-term growth potential. Oberweis selects companies that meet this criteria based on, among other things, fundamental analysis of individual securities. 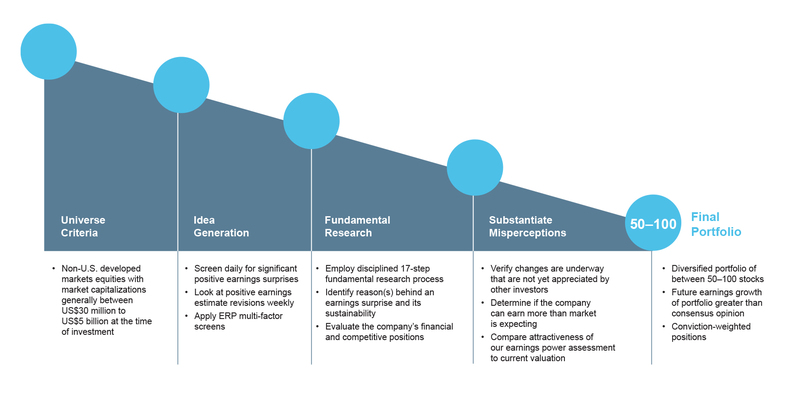 Oberweis’s fundamental analysis entails an evaluation of an individual company’s future growth prospects. Oberweis’s evaluation may be based on, among other things, financial statement analysis, stock valuation in relation to Oberweis’s estimate of future earnings, evaluation of competitive product or service offerings, future research and development pipeline, and management interviews. Oberweis may actively trade the Fund’s portfolio, and as a result, the Fund’s portfolio turnover rate may be high. There are no restrictions on the capitalization of companies whose securities the Fund may buy; however, the Fund generally invests in the stocks of smaller companies. Oberweis generally considers companies with a market capitalization of less than $5 billion as small-size companies. The gross expense ratio of expense off set arrangements and expense reimbursements was 1.15% for OBIIX. Oberweis Asset Management, Inc. (OAM), the Fund’s investment advisor is contractually obligated through April 30, 2019 to reduce its management fees or reimburse OBIIX to the extent that total ordinary operating expenses exceed in any one year 1.10% expressed as a percentage of each Fund’s average daily net assets. The annual expense ratio will reflect a blend of both the old and new expense reimbursement arrangements in effect for 2017. Our process rests on our firmwide commitment to uncovering and capitalizing on the persistent and recurring stock pricing inefficiencies in small-, mid-cap, and emerging-growth equities caused by a lag in investor response to new information. This lag in recognizing the catalysts likely to positively impact future earnings growth drives the security selection across all our strategies and mutual funds. The criteria used within each product, however, can differ. This is how our investment team implements our philosophy in the International Opportunities fund. The MSCI World ex-USA Small Cap Growth Index (Net) is a free float-adjusted market capitalization weighted index that is designed to measure the equity market performance of small cap growth developed markets excluding the US, with minimum dividends reinvested net of withholding tax. Performance data shown represents past performance and is no guarantee of future results. Investment return and principal value will fluctuate, so that you may have gain or loss when shares are sold. Current performance may be higher or lower than quoted. Visit us online at oberweisfunds.com for most recent month-end performance. Source: Eikon - Sector data based on MSCI’s revised Global Industry Classification Standards. For more details, visit www.msci.com. Top 10 Holdings and Sector Weightings as a % of Total Net Assets The Oberweis Funds releases the top 10 holdings as of the most recent quarter-end after a 60-day lag. A complete list of holdings can be obtained by contacting a shareholder services representative after the aforementioned 60-day delay periods. The Oberweis Funds invest primarily in small-cap companies, which may have volatile price movements. Continuous publication of the Funds’ current holdings has the potential to affect trading volume and the prices of the securities in which the Funds invest. By delaying the release of the holdings, Oberweis may be able to deter front running by traders who could impair our ability to build positions in our best ideas at the best prices. Portfolio holdings are subject to change at any time. References to specific securities should not be construed as a recommendation to buy or sell and should not be assumed profitable.